Home makeup kit traincase My New Soft Sided Traincase! I'm so excited to finally show you my new traincase I've been using. I wanted to wait until I actually had some traveling gigs to test out how this would handle on the road. 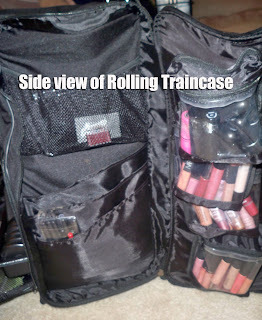 Now don't get me wrong, I love my current hard sided traincases like this one I got from Yazmo.com. I love how it's so huge and can fit all of my kit supplies...but trying to lift this up stairs and into small spaces can become a pain! 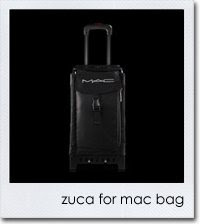 You guys remember how I was feening for the MAC Zuca Soft Sided Traincase? Honestly, I just couldn't justify spending $270 for the one small piece. In case you don't know this by now, when it comes to something I want, I'm a Googler! I wanted to find a more cost efficient alternative...I found one! 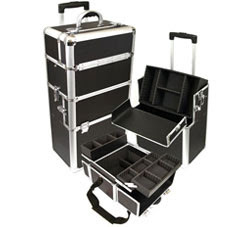 On Yazmo.com they have the Pro Soft-Sided Rolling Cosmetic Case with Trays TS-100 and they also offer a matching Pro Soft Sided Carry On Cosmetic Case with Trays TS-99. Both pieces combined are still less than the Zuca bag! I had two gigs this past weekend...an airbrushing gig and then an Indian wedding. I packed the two cases separately for each gig to see how they held up. When I first checked these traincases out I was amazed at how many drawers, clear zippies, compartments, brush holders these things had! 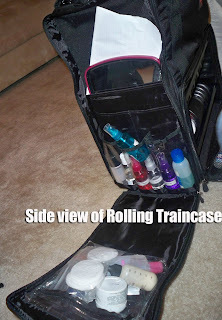 I love keeping my items over the top organized so I was excited to see that these traincases were really designed for a makeup artist. 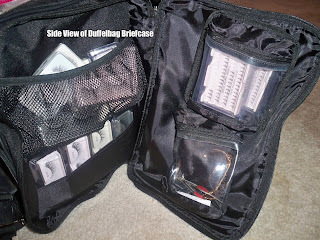 You can tell by the little touches...removeable velcro baggies, clear zipped up compartments...trays with removeable dividers. The only thing I was concerned with was being able to find my items with the millions of different sections and compartments. 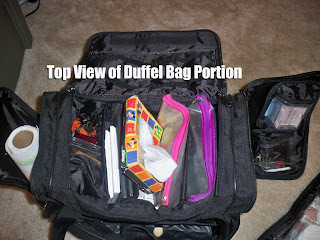 You need to check out my video to see how I fit everything in the bag. Check out my video showing off the traincases. Mind you the video is 24 minutes long...the reason for this is also because I show you exactly what I packed in the traincases for both gigs. So not only do you get to see the new traincase, but you also get to see an updated makeup kit vid. I love these traincases! What a weight off my shoulders...literally! The weight of both pieces is probably a third of the poundage of my hard traincase set. It was still annoying to drag it upstairs, but I could do it far more easily than before. 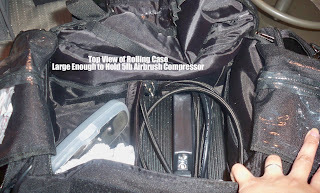 I'm loving the little velcro pouches they include as well as the large space inside...big enough to fit two regular sized airbrush compressors. 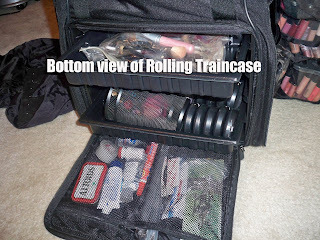 Remember to try and keep this traincase standing upright when traveling...that way things don't fall out of the compartments. Also, if you're worried about powders cracking in palettes, you can always keep them in the carry on case and carry it over your shoulder. First we'll start off with the TS-99...I call it the duffelbag traincase because that's what it looks like to me. 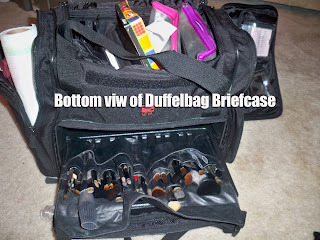 I keep all my lashes and glues/tweezers/scissors to apply them in the side compartment. 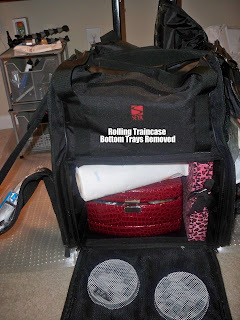 These are the removable velcro baggies on the right I was talking about. Next we'll move onto the TS-100...the Rolling Traincase as I like to call it. Top portion contains foundations, powders, blushes. I keep business cards in the side flap. Side portion where I keep all the skincare stuff...along with a mirror and contract. Here is my lippies section...glosses, lipsticks, lipliners..lip palettes. 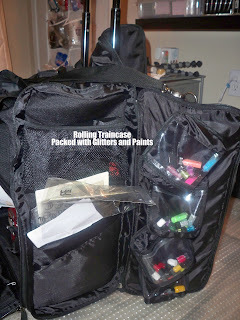 Now just the rolling traincase packed for my airbrush tattoo gig. I removed the drawers in the bottom compartment so I could fit a mini traincase filled with paints along with my tattoo book. You really need to watch the video to see the products and traincases in better detail. Meanwhile, Yazmo is generous enough to offer 10% off with the code RENREN. 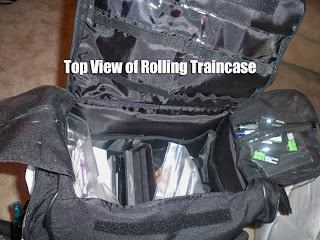 I'm telling you, this site is one of a kind...the only place to find professional train cases in so many styles and a good price. Check them out! hi this is my first reply. just want to let you know that your site is great and i've added it to my list. and I LOVE your new traincase!!! You have been a big help in my decision of picking a traincase. I'm a weakling and I dont think I'd be able to lug that hard case around. In the soft case I think you said that you can put an airbrush compressor in the bottm compartment. Do you think it would be secure in there and not be damaged? wow, just when i'm looking for a new train case! i was really happy after i got my graftobian palette and i think i will take the plunge and invest in this too. thanks alot! soo jealous of your traincase! Haha that is the EXACT same traincase I have been eye-ing on but I always put it off thinking I don't need it but you have changed my mind!